In this project I have put all of my experience and expertise in my field. As a post-modernist art indie game developer working pro-bono for the brony fandom, I give you this piece that I consider my greatest work made to date. I don't consider a fnagame a mere fangame, I consider this a whole new genre. A whole new form of media in fact as it shows my humble attempt at transcending all definitions, while making a highly addictive and highly enjoyable video game. Now the story premise of this game is my reaction to the, as of late, increase in the size of the alicorn princess character archetype, that has occurred ever since Meghan McCarthy has established herself the leader in the creative direction of the my little pony franchise. This is my cry against this development as she clearly demonstrates no level of restraint, in her idea that (and I quote) "Every little girl wants to be a princess." The projections of her agenda of a Disney-eque fantasy land, propagates her desire to indoctrinate all little girls. Just as she had been herself in her youth no doubt. The story of this game is the end result. A world engulfed in a horror filled world of princesses and alicorns. The representative of all that is good the mane 6, establishing themselves the side of right as they fight the good fight, outnumbered, underpowered and heavily outclassed. As you might have surmised, this game does not have a good ending. There is no hope. There is no redemption. The damage has been done, and despite the heroic efforts of you (the player) and your friends. There is no end to the vast army of abominations. I would like to make it known that I do in fact know that not all of these characters are in fact alicorns. This is entirely intentional. To the untrained eye one might think that this is due to resource constraints but no. In actuality, this is an intentional design choice to express and emphasize the sheer illogical process of creating more deities in a universe that does not require any more than the moon and the sun and their successor. The stars. Which brings me to my next design choice. I chose purple bullets because of Twilight Sparkle. She is representative of boundless potential for all, numberless stars shining brighter and brighter, as foretold by the stars themselves. Indeed, you heard me right. The stars make their own fate and as such drive on to save the world in that belief. No matter how hopeless that belief is. But sometimes the reality will make that impossible, however as fnagame you can infinitely and indefinitely keep trying and reach for the stars as you dance among them in the sky. Is it not beautiful to behold? Now the cast are of the likeness of the ponies we know and love, but I assure you, these are not the ponies you think they are. In this story, the mane 6 are gone and the princess as well. They are now stepped down for their successors to size forth and claim their right to be righteous with their might. I made this choice because out of respect for the creators, I honor their work by mimicking their likeness in my fnagame. However I do not profane them by stealing their names. For those names are sacred things, trademarked and copyright by Hasbro. it wouldn't do to have a cease and desist placed upon me, for intimidating Hasbro with the sheer popularity this project will no doubt gain. Twibright Spankle, Paddlejack, Flutters, Pokey Pi, Colorful Speed, Pearity and Sirelestia are the names of these new characters. If you survive long enough in this fnagame. You will find an encounter with Sirelestia. She is represent of a lesser being reaching her potential and amounting to barely anything but a mere mid-boss (represented by her yellow bullets). She is vastly more powerful than you but it is possible to defeat her if you, lower her hp to nothing and force her to fly up to the top of the sky. Showing her cease her ascension to greatness and naturally, eventual fall caused by the true inheritors. 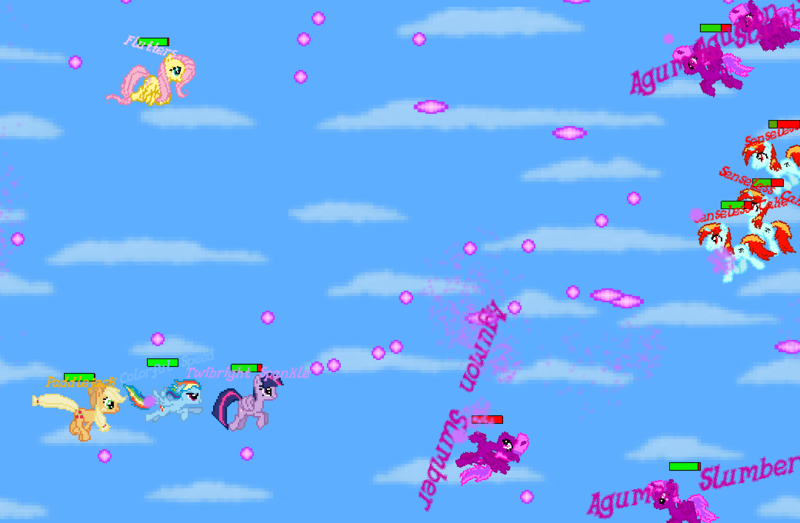 You might also notice a few other ponies in the game besides the aforementioned. These are characters who act as the challenge for the idea of true auteur, for the characters Agumon Slumber, Senseless Cake, HeyoWhosagani, Panni, and lastly Pork X, are names that parody my friends who have acted as a great inspiration for this masterpiece. As such I do not solely consider this game as my own creation. But a collective creation both made by my inspired genius and the inspiration made by the power and magic of friendship. Just as the show has taught me. Speaking of friendship, I put two sets of controls for movement not only to cater to a single player's preference, but to also acknowledge the importance of multiplayer in this era and genre of interactive video games. What fires my ire for these modern games is the competitive nature of multiplayer in this era, even in instances where cooperation is enabled. For instance in games of the genre this fnagame was inspired, you hold high scores for each player. But in this fnagame, you control only one character and as two players you must work together for the success of this character and create a highscore for not only yourself, but for both of you. I also implemented a high score system, as to show you that despite your failure to save the world within the game. You still have the potential to grow and succeed beyond the supposed limits you hold. As a final note I would like to leave to what inspired me to have the fire button be the same as the move buttons. I believe that to succeed in life, you must aspired to move forward. Which you cannot do by standing still. what exactly is this 'new genre'? why has it suddenly popped up now? is it simply just games that go all out in mocking the copyright around using real character names, or more than that? It all born when XTUX from Equestria Gaming posted a picture of a Bronycon event. That Picture contained a typo: "How to get started making your own FNAGAME". From there, in the cloudsdale chat, XTUX came up with this "new genre", that mostly mocks up other games and/or developers and is basically full of troll games. We (Dark_X, me and XTUX) then decided to make some fnagames. the first to finish was Dark, that got his post on EQG. And this is basically all, since it started yesterday and there is only my fnagame besides Dark's. did he actually think of the genre thing? mind was foggy of that time. all i recall is the essay I wrote and xtux's attempt that had no real understanding of the audience his satire was for.